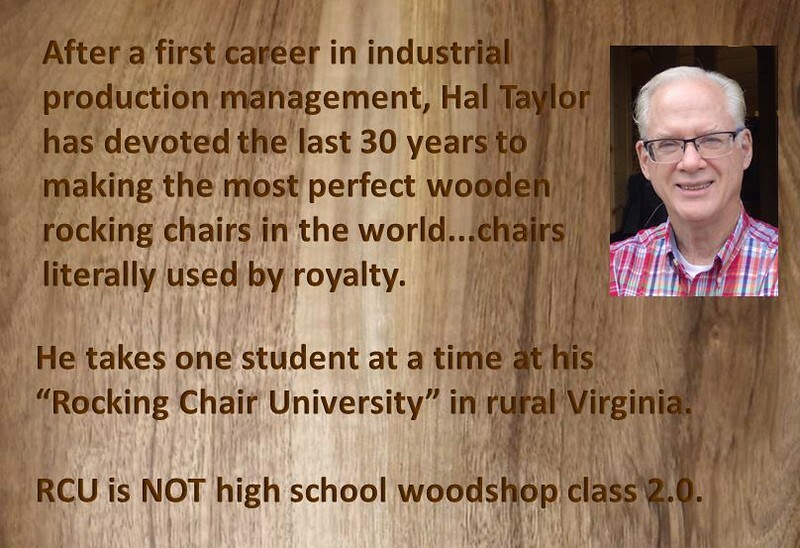 Rocking Chair University is an amazing two weeks working with Hal Taylor, one of the world's master creators of high-end wooden rocking chairs. 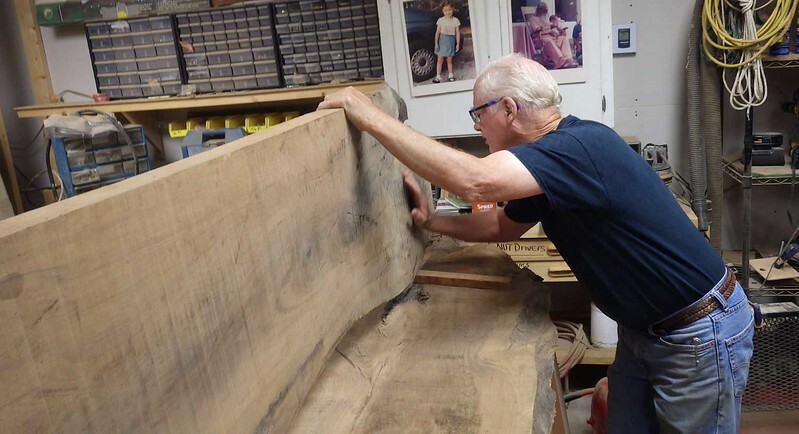 Hal Taylor devotes his life to making absolutely the best wooden rocking chairs in the world--and to teaching others to do the same. You'll never meet a more generous and patient person. It was a real privilege to make my first chair under his mentorship. You start with a visit to Hal's woodshed. 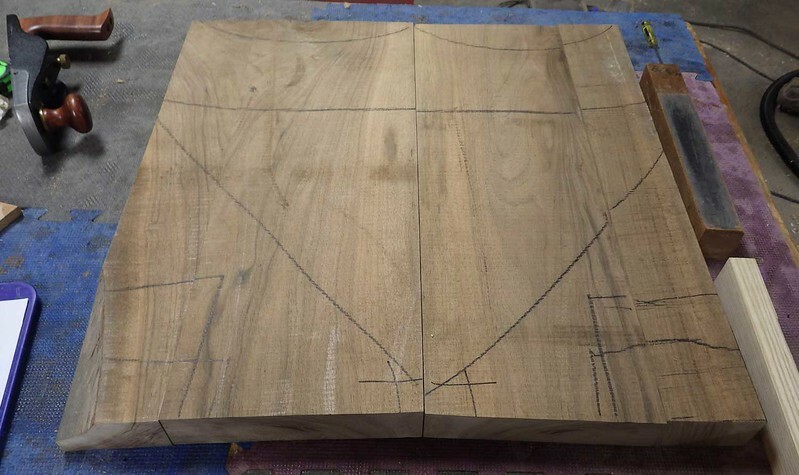 I had my heart set on using English walnut (Juglans regia), which is a very aristocratic wood suitable for someone with latent monarchist tendencies. 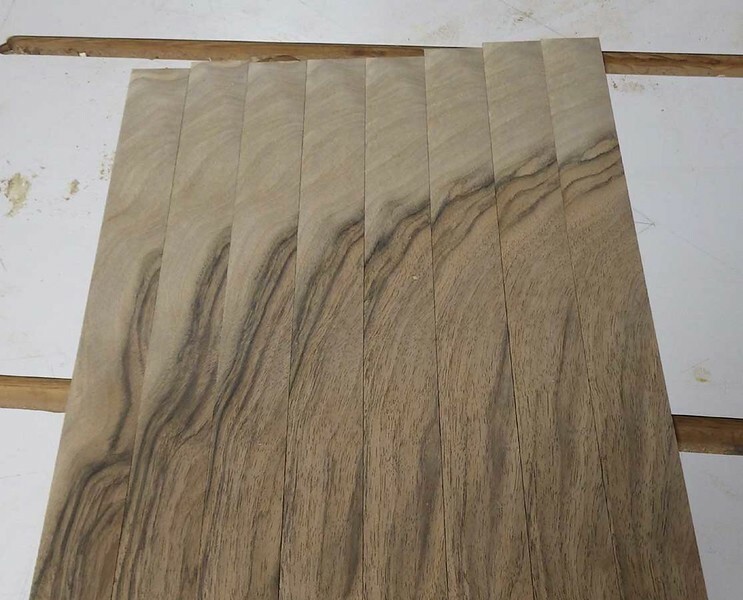 After picking a few flitches of English walnut, we began looking for just the right grain pattern to give artistic matches for the seat, arms, and other pieces. 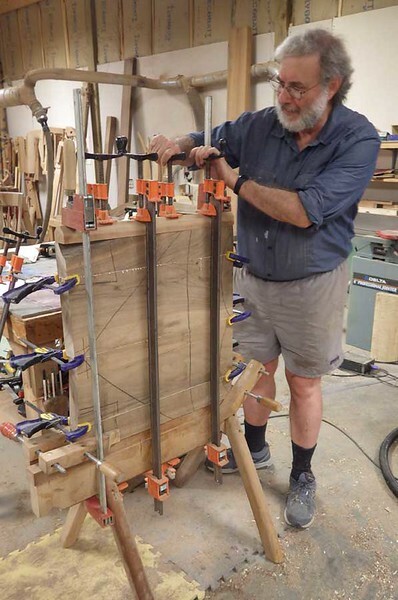 After 30 years of making chairs, Hal has a pattern for cutting every imaginable chair piece and size of chair. This is a priceless amount of intellectual property. Within an hour we had found just the right pieces for the seat. 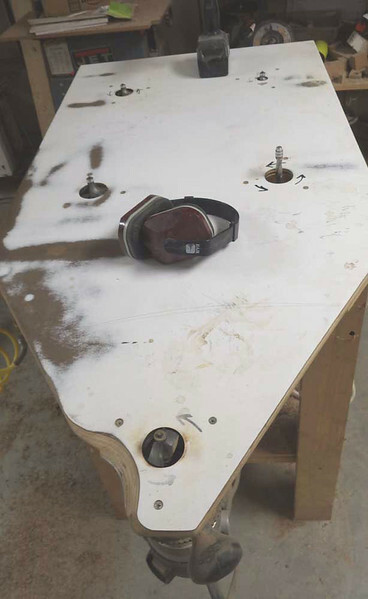 By the end of the first day we had glued up the seat. 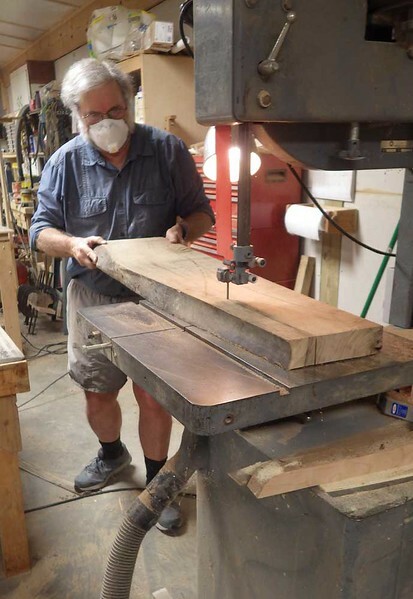 After planing the seat to thickness, and cutting notches for the legs on a table saw, the notches are routed to make tenons for the legs. 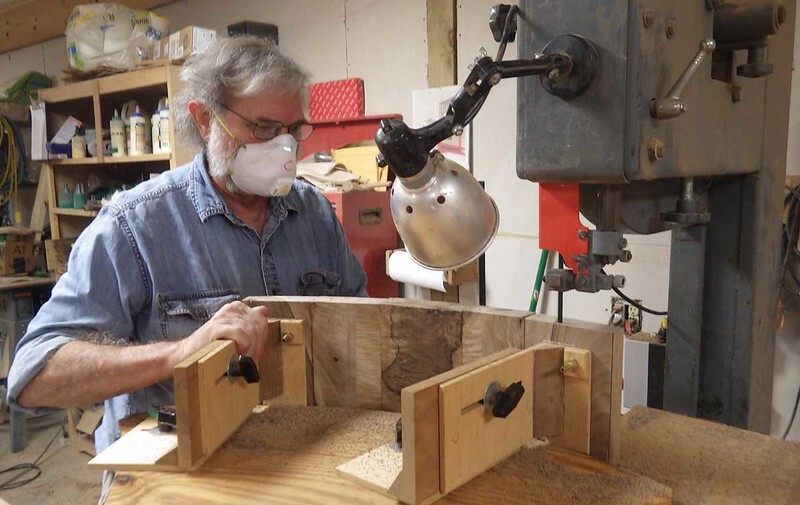 Speaking of routers, Hal's router table has five routers, each with a different bit perfectly adjusted for a particular cut. 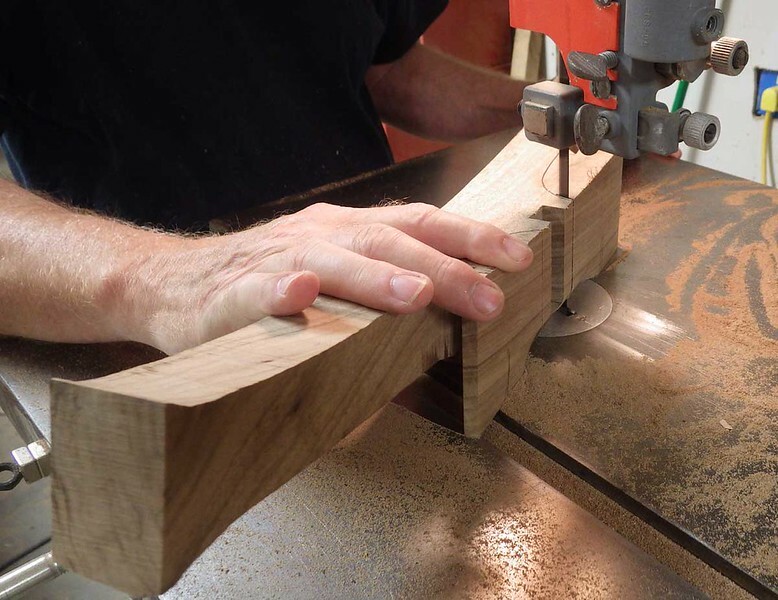 No time is wasted changing router bits or setting bit heights. 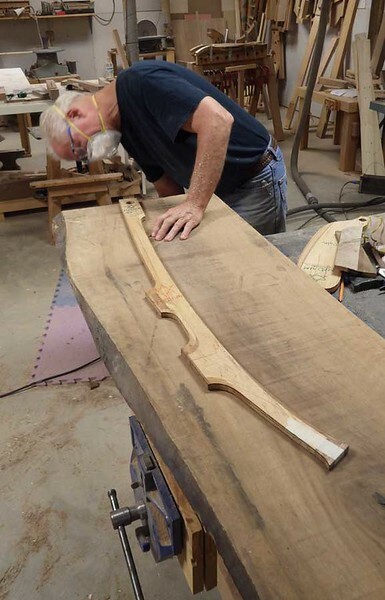 Here we are laying out the back legs so that the grain will run just right. 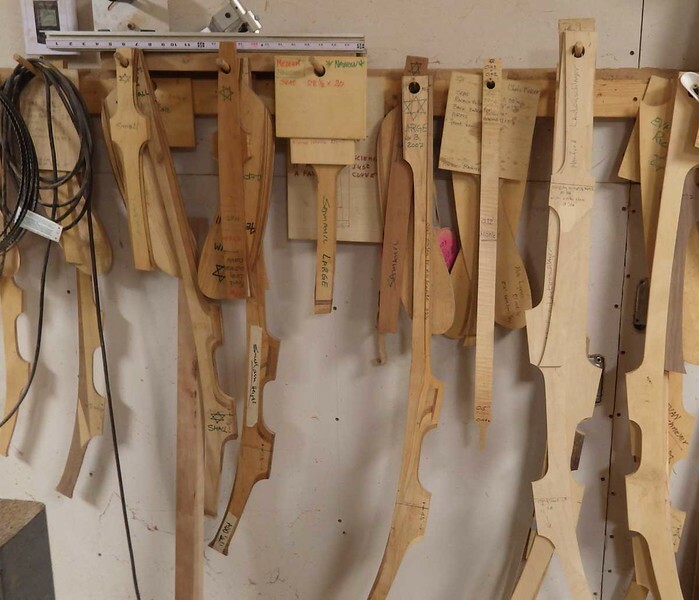 After the layout, the next step is to band saw out the rough leg shapes. Then you have to joint the leg pieces to get one side perfectly flat. After gluing on adder blocks to give more wood where the legs join the seat, you cut the legs to a roughly final shape. 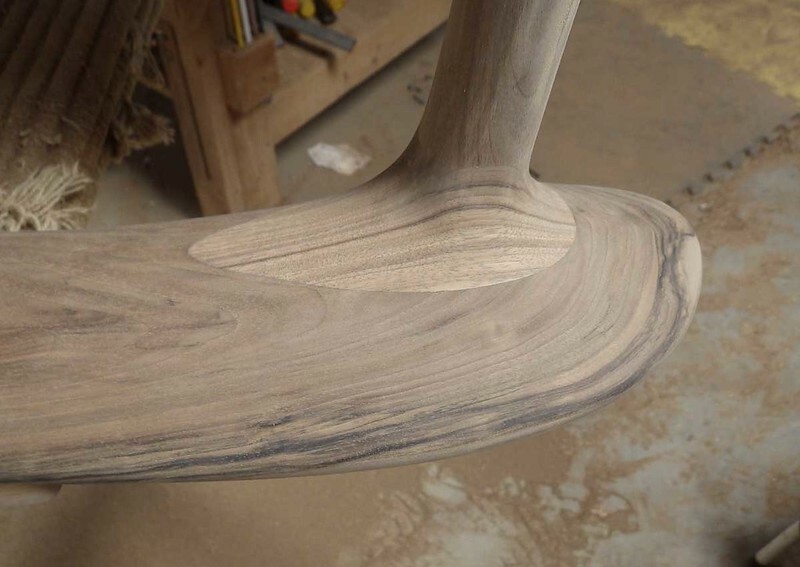 We now have back leg billets ready for further shaping. 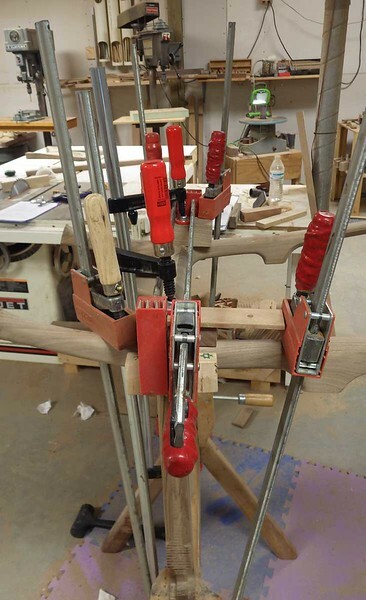 Somewhere underneath all of the clamps the back legs are being glued to the seat. We set aside a piece of wood that looked like it would give a nice grain pattern for the back braces. This was then cut into lamina on a table saw with a very thin blade. 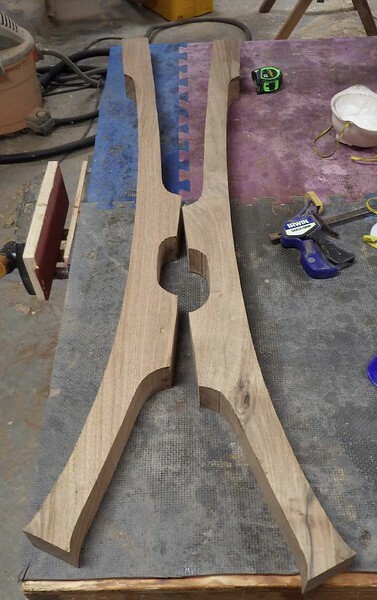 The back braces are layers of walnut, mountain ash (for just the right amount of flex), tapered walnut at the top and bottom centers, ash, and walnut. These lamina are glued for 24 hours in a fixture that gives them just the right curved shape. The rockers are also glued for 24 hours. I'm guessing Hal must have over 200 clamps. 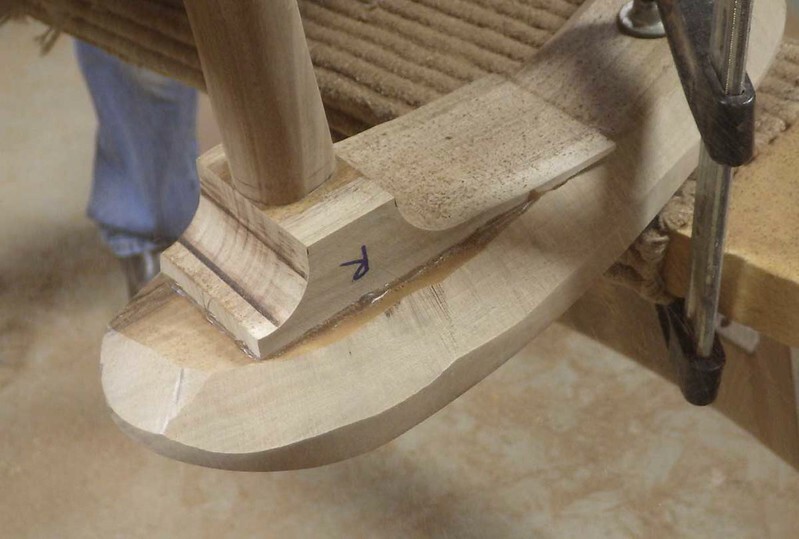 After the back braces are cured and cleaned up, tenons are cut in the ends. These will fit into the holes in the seat and head rest. 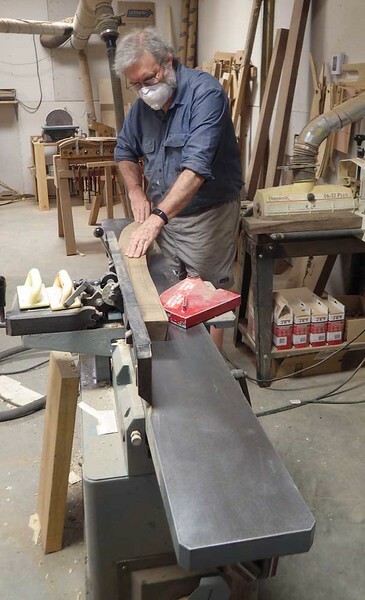 Finishing the back braces requires a good bit of band sawing, shaping on a spindle sander, routing the edges, and sanding. Here's the underside of an arm showing the arm, and adder block, and the front leg. 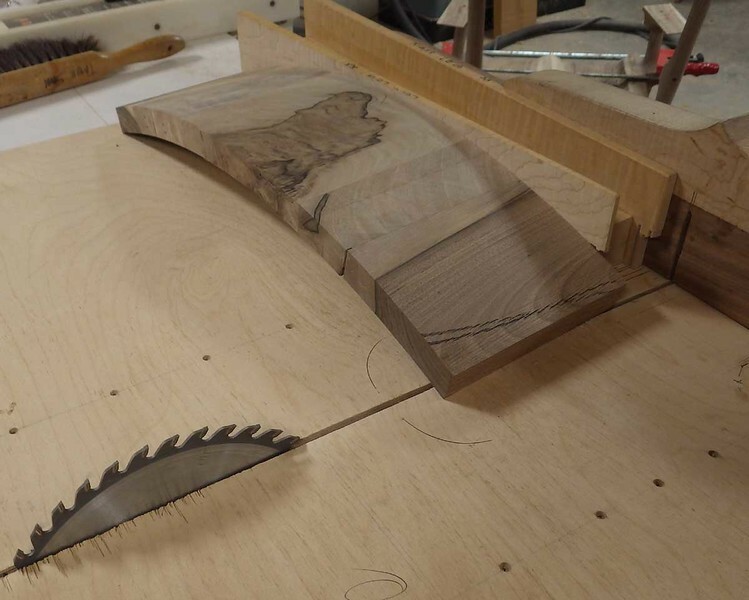 This is as far as you can go with a bandsaw. 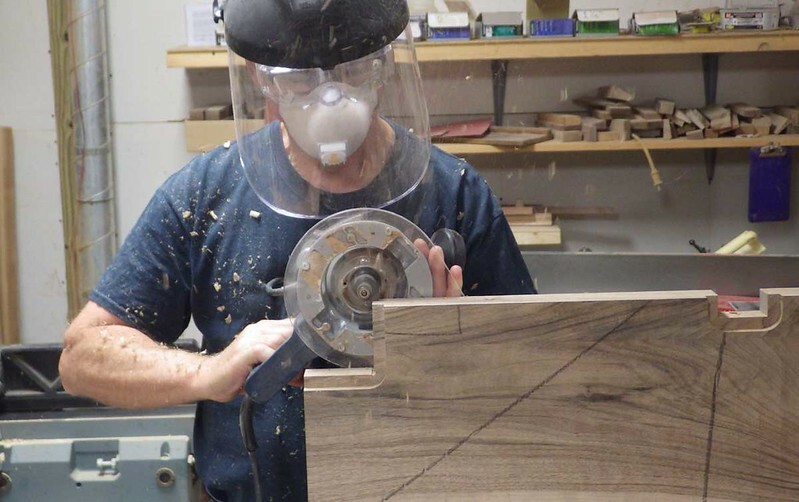 The next step is use a right-angle grinder to start shaping the bottom of the arm and the joint between the arm and the front leg. After a good bit of grinding and then sanding with a random orbit sander, you finally end up with an smooth transition from leg to arm. Only a small part of the adder block remains. I spotted a piece of wood with a pattern of heart and sap wood that would make a nice center of the head rest. This was then balanced with other pieces to the left and right. 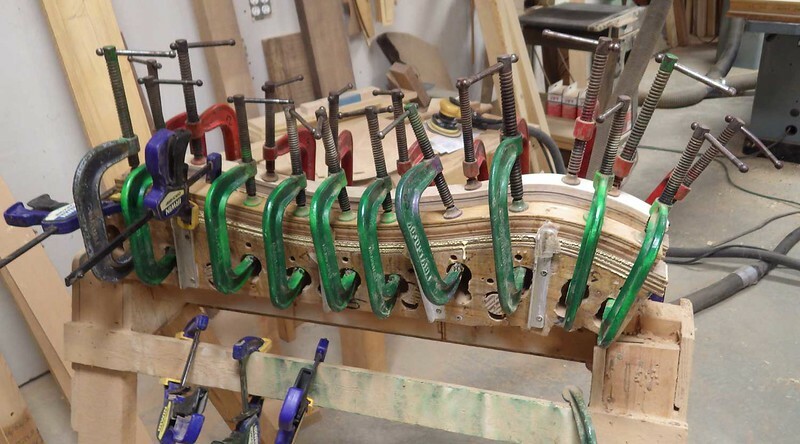 These pieces were glued up a pair at a time to make the curved head rest. 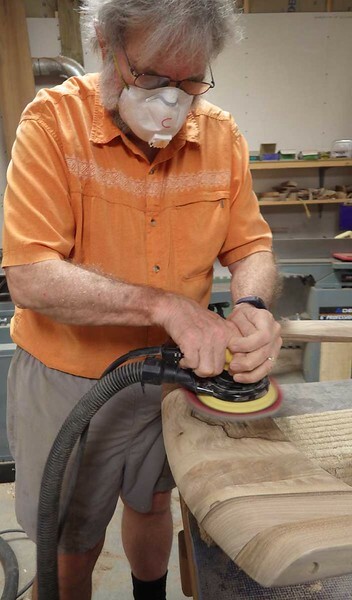 Here I am cutting the head rest to make a coved head rest with just the right radius. As always, Hal has a fully adjustable fixture that can cut a head rest of whatever radius is required for a particular sized chair. 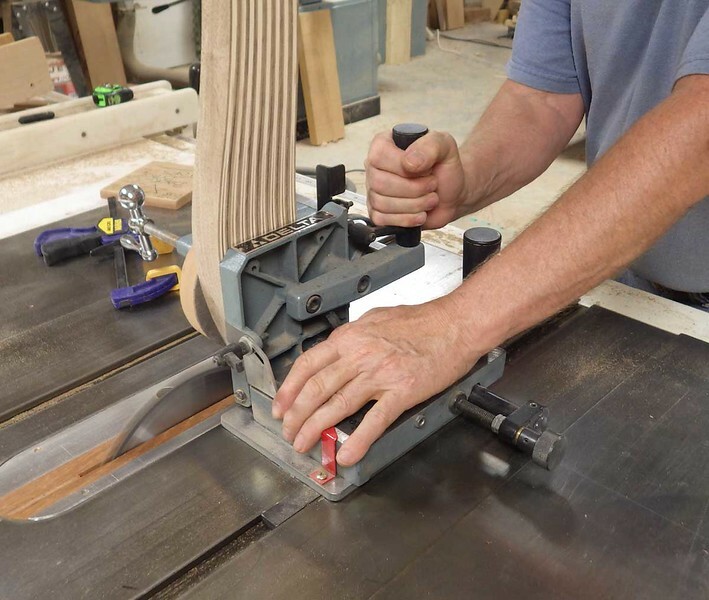 Using a single-purpose fixture, the ends of the head rest are simultaneously cut at a 20 deg angle in one direction and 6 degrees in another. 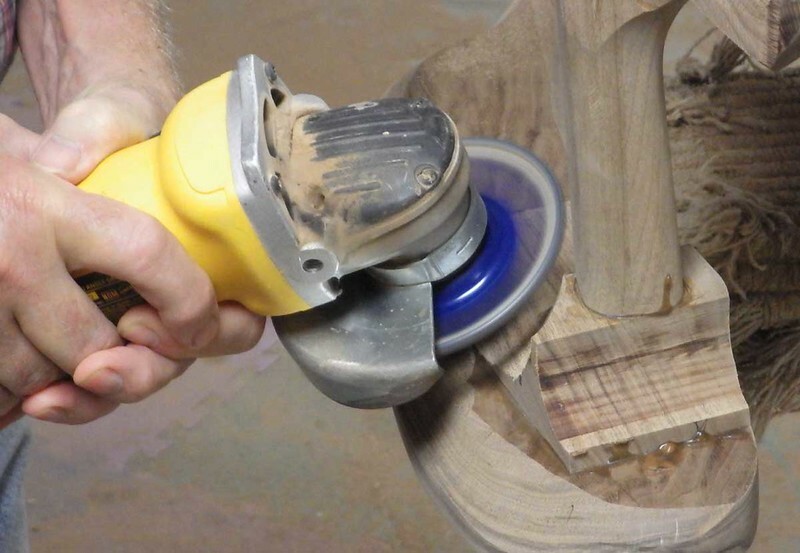 Just as for the other parts, shaping the head rest requires lots of grinding and sanding, with final polishing by Abralon (bascially 1000 grid sand paper), which leaves a glass-smooth finish. 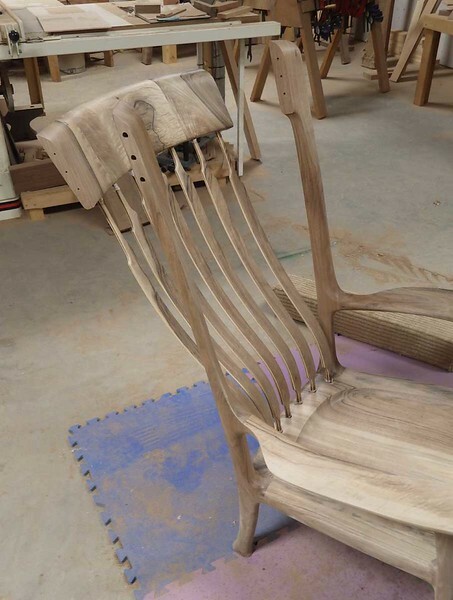 After a week of work, the various pieces of weirdly shaped wood start to come together and take on the appearance of a chair. 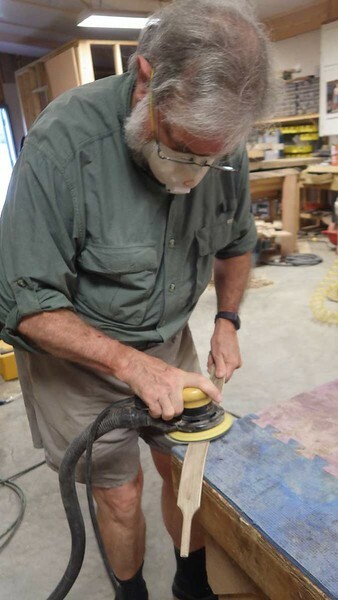 Here we're doing final testing to make sure the back braces fit perfectly before gluing the head rest to the back legs. Then one day you take off the last glue clamp and do a bit of touch up sanding and polishing, and it's ready for a coat of oil. 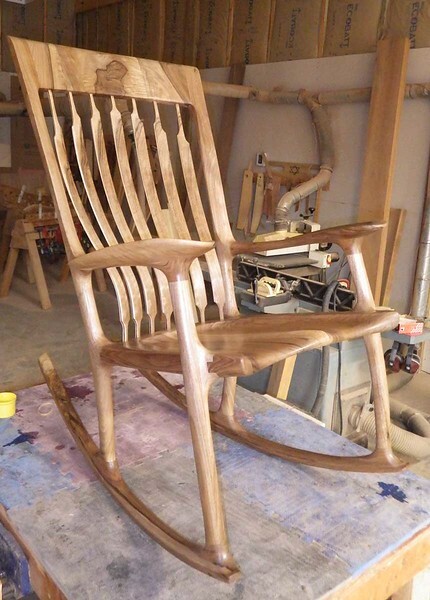 We completed this chair in 8 days, which Hal said was the fasted he had ever built a chair. I guess that means I didn't get in his way too much.